First of all, I am proud to say that Alexander Noel provides the best of both Blake stitching and Goodyear welting. We have searched for high and low to provide you the best of quality and comfort. Shoes can range in different prices, but one key factor is that construction of the footwear, play a tremendous part of the quality. With men’s footwear, you can have several similar style shoes ranging in price from $90 to $2000 with the key factors being the brand and the overall shoe construction. Quality and durability are key. A key component of any shoe starts with a solid welt. A welt is sewn at the edge of the surface of the lasted shoe and its technical purpose is to bond the upper and the insole while at the same time, providing a flat band around the shoe for the sole to be stitched on. The upper, insole and welt are stitched together with one seam. There are two primary ways to do this – Blake Stitching and Goodyear Stitching. The Blake Stitch is the more recent innovation between the two processes, it was created during the Industrial Revolution and greatly simplified the welting process while retaining the structural consistency of the earlier Goodyear welt. Blake stitching, which is known for being a simpler process, due to a single stitch attaches everything together. Shoes constructed with the Blake stitching technique require the upper component of the shoe to be stretched around the insole, and then a single stitch to bind the outsole, insole, and upper together. 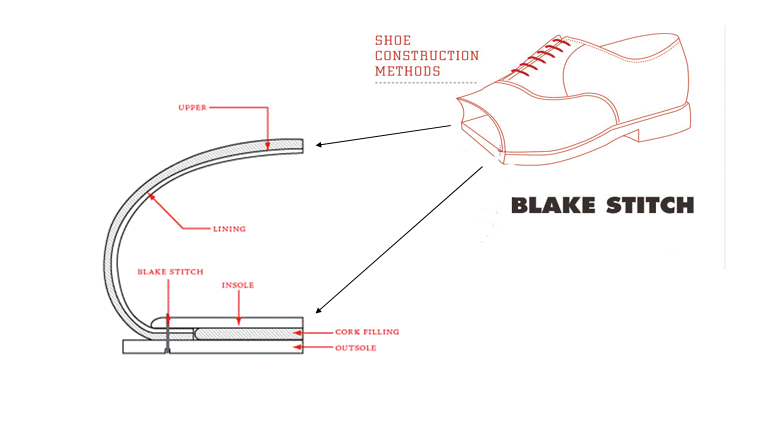 Because it is stitched within the inside of the shoe, Blake stitch requires a specialized machine to stitch the sole to the upper. In 1869, Charles Goodyear Jr. changed the face of modern shoe production by developing a new kind of durable, reusable welt. Prior to the invention of the Goodyear welt, outsoles were painstakingly hand-stitched directly to the underside of the insole. The Goodyear welt allowed the outsole to be stitched, either by hand or machine, outside the edge of the insole, making it far easier for cobblers to re-sole shoes. The Goodyear welt acts as bridge between the outsole and the insole of a shoe. The space between the insole and the outsole is filled with cork, giving the shoe an extra degree of support. There are certainly good reasons to select either the modern and traditional way of stitching a shoe. So whether you select Goodyear or Blake stitching, here are a few of the advantages and disadvantages to consider when deciding on your perfect shoe. Blake and Goodyear methods are not better than each other, as both have advantages and purpose that they best serve. As a shoe aficionado, it’s always great to have a combination of both styles in your closet.